Little league action between Fairfield American and Westport at Unity Park in Trumbull, Conn. on Saturday July 12, 2014. The Fairfield American Little League all-star baseball team, days removed from its 2014 District 2 championship victory over Wesport on July 12, is preparing for its next challenges in the sectionals, which on two fronts should be more demanding than clearing its first hurdle at Unity Park in Trumbull in games over a nearly three-week span. 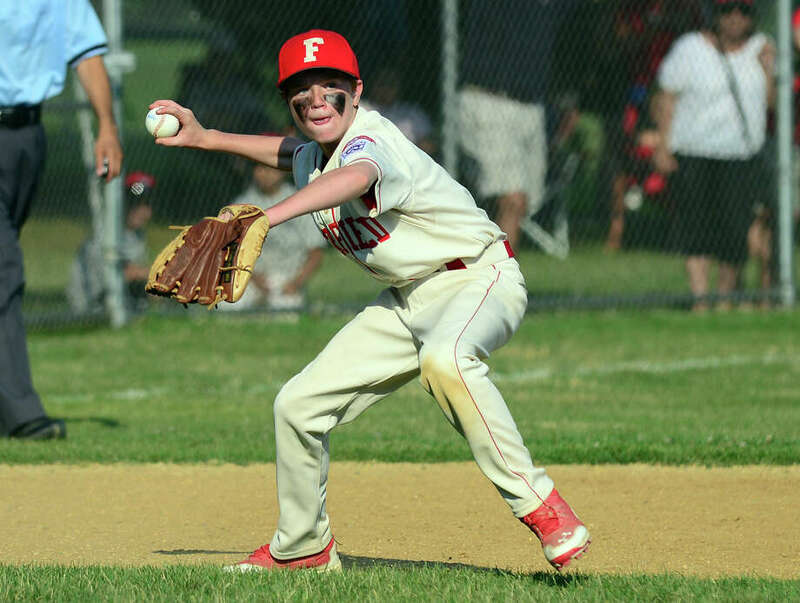 Fairfield (7-0) now must outplay teams that survived double-elimination play in Districts 1 (Norwalk) and 4 (New Haven Annex) over games from Thursday through Sunday in a divisional competition in Orange. Then if the American succeed in this stage, it will play the section's Division 2 champion in the sectional final, a one-game, winner-take-all format on July 23, also in Orange. The sectional winner will meet the state's other sectional winner in a two-team, double-elimination state tournament from July 26-28 in Harwinton. Fairfield manager Michael Steed has the team's focus where it needs to be, concentrating on the task at hand, not looking toward tournaments that might or might not be on the horizon for them. That approach -- being ready for the current pitch, at bat, inning and game -- has helped lead them into the sectional divisionals. That and displaying no apparent weaknesses on the mound, in the field, on the base paths and at the plate. Fairfield's well-rounded play has been noted by other managers in District 2. "American is a solid team in every aspect," said Fairfield National manager Dr. Brad Weinstein, whose team went 4-2 and reached the four-team, double-elimination phase of the district tournament. "They are strong at catcher and up the middle as well. Their middle infielders do a great job of keeping everything in play. They are well coached and disciplined. Michael Steed does a excellent job of preparing the boys. "With pool play dictating a schedule playing a strong team every two to three days, American will need another pitcher to step up to match PJ Egan's stellar performance." Steed has been proud of the American's pitching and defense. But the talk surrounding fans and other followers at Unity Park has centered much on Faifield's batters. Even Steed concedes his hitters are not at the stage of hoping to make contact. A few of their batters are so potent, there's a danger of any of their fly balls into the outfield carrying over the fence. Fairfield has blasted 24 home runs in seven games, which is almost an average of 3.5 a game. Two players have accounted for 15 of them -- Brian Howell with eight, Vince Camera seven; eight have connected for round-trippers; four have blasted two or more homers -- Jamie Flink and Ian Bentley as well. The Americans' team batting averge was .460 (80-for-174). Their 77 runs scored works out to 11 a game. They drew 24 walks, were struck out 22 times. Their on-base percentage was .550; their slugging percentage .813. Three players have 10 runs batted in or more -- Howell (19), Camera (13) and Bentley (10). Bentley is 12-for-17 at the plate for a team-high .706 batting average. Camera is next at .650, followed by Howell's .565, Flink's .474, Connor O'Neill's .429, Jack Steed (.412) and Brian Kiremidjian (.400). Camera leads in on-base percentage at .727 as well as being the pace-setter with a 1.750 slugging percentage. Bentley and Steed share with the most singles, eight; Flink and Bentley share top spot with two doubles each. John "Scooter" Reynolds is the only player with a triple. The worst batting average for players with at least 10 at bats, by a reserve, is .273, and that player had scored four runs in 11 at bats. On the mound, Egan has started four games and won three of them. Flink won two, as did Sam Davenport. Egan, who has the most innings pitched, leads with 29 strikeouts. Davenport has 12 Ks, Flink seven and Bentley two. Howell has pitched, too. "I'm very pleased with our pitching," Steed said. "PJ Egan has been phenomenal. All three starters (Egan, Flink, Davenport) have had well-pitched games." Fairfield has allowed 17 runs, or an average of fewer than 2.5 runs per game. In five of the seven District 2 games, the Americans held the opposition to three runs or fewer. Steed said the rotation and bullpen assignments will depend on how the divisional unfolds, in addition to him considering weekly pitch limitations. "Our defense has played really strong," he said, noting how a mere five errors have been committed by American fielders. "In addition to playing tight defense, we've had some impressive plays in the field -- laying out, making double plays -- at clutch times," Steed said. Steed, who did not have an opportunity to scout Norwalk or Annex, said he is expecting the competition to be tougher than what was encountered in District 2 play, both from opposing pitchers and batters. "Top to bottom, every kid (on Norwalk and Annex) has the ability to put it out of the ball park. Our pitchers cannot lose concentration for any batter even if we have what is who perceive is a comfortable lead. "These teams have been playing at a high level at the district level for two weeks. They are game ready. We'll see a variety of pitching -- righty, lefty. We're gearing up for any every offensive situation. "We cannot rely on hitting at 100 percent; we cannot rely on outslugging another team because they all have capable hitters," Steed said. Some of the players' intangible characteristics have impressed their manager. Steed said he likes the team's togetherness and lack of ego.